"I came across Goivvy when searching for magento upgrade help, the last upgrade I did myself but it wasn't straight forward so I didn't fancy having another go. I emailed them and got a prompt reply from Konstantin, I told him what I wanted he gave me the price and time scale when he could do the work, we agreed the upgrade between 5-6pm, when the day came I checked my site just before 5pm and noticed the upgrade had already taken place, I then received and email confirming this, I must say I was extremely impressed. The upgrade went fine apart from a few small issues which was fixed really quickly, no 9-5 for this guy, he's answered my emails at all times of the day, certainly "out of hours". I would be more than happy to talk to any future customer of Konstantin's over the phone, this is a real review from a real person. I won't use anyone else in the future for my magento site." Magento core team constantly work on code improvements. You should upgrade your online store once the new release is out. Security patches, design updates, new features - all come with latest magento version be it community or enterprise. While you can do upgrade yourself it often makes sense to ask experts to perform it for you. 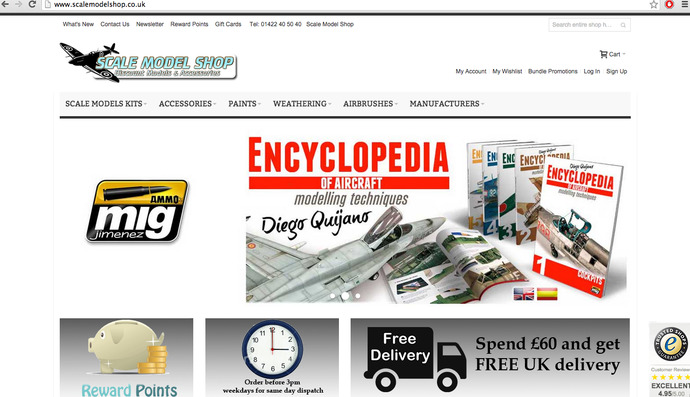 Scalemodelshop.co.uk came to us with magento upgrade problem. Last time the owner tried to perform an upgrade himself but failed which left his webshop broken for days. This time he decided to get magento experts to do the task the right way. First we setup the stage enviroment so that we could test the upgraded website inside out. That helps identify the upgrade-related problems and solve them quickly without affecting sales as the production website stays online and fully functional. Second we checked the installed third party extensions to make sure they all work well with the new magento version. For some we got updated packages from vendors others seemed ok.
Upgrade itself on development website went ok. There were some issues with backend functionality that we fixed quickly. The client as well reported problems with frontend - we needed to patch the used theme template. We were ready to repeat the procedure on production. We put the website into maintenance mode - that should not affect sales much as the process should not take longer than 2-3 hours. We upgraded the live website, fixed backend and frontend and it all took less than an hour! We were prepared as we tested it all on stage enviroment - that is why we spent time setting it up. We put the website back online and it was ready to receive traffic. It was working well and the client was happy!